When Napoli last won the Scudetto in 1990, Mario Filardi left his home in the city’s Spanish quarter, a tin of paint in one hand and a brush in the other. His canvas was the facade of an apartment block on via Emanuele De Deo. On it he would leave a mural of Diego Maradona. Over the next quarter of a century, it fell into disrepair. The paint faded. The stonework chipped. Salvatore Iodice, a local artist, despaired and decided to do something. He appealed to residents for their support and went house-to-house asking for donations. He then lobbied the local authority for permission to restore the mural. Last month Iodice followed in Filardi’s footsteps and coloured the mural in again. On the night of March 5, a huge celebration was held. Fireworks were let off. Flares lit. A big crowd gathered, bolstered by fans returning from Napoli’s win against Chievo. As an occasion it had an unmistakeable symbolism to it. The days of Maradona are not gone. They are back. If Napoli do win the Scudetto, it wouldn’t be at all surprising to see a mural of another Argentine grace the side of a building. 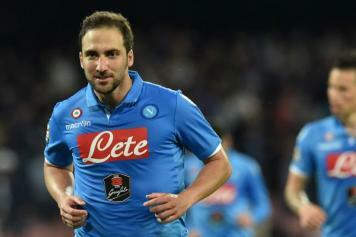 Gonzalo Higuain is the most decisive centre-forward in the world at the moment. Bold claim, I know. But consider the evidence. No one in Europe’s top five leagues has scored as many times  as he has this season. Cristiano Ronaldo  Luis Suarez , Lionel Messi  and Neymar  are all behind him. Harry Kane  and Jamie Vardy  aren’t even close. Robert Lewandowski and Zlatan Ibrahimovic  are on pace but Pierre Emerick Aubameyang  has relented. Even taking the continent as a whole into consideration only one player is matching Higuain. That’s Jonas at Benfica. For the first time in almost a decade the European Golden Boot could go to a Serie A player. To give an idea of just how rare an occurrence that is just be aware that it has happened only twice before. Curiously after waiting decades for one, two came along at once. Luca Toni was presented with it in 2006 then Francesco Totti in 2007. Both were exceptional achievements. Toni did it in a year when Lilian Thuram, Fabio Cannavaro, Paolo Maldini and Alessandro Nesta were all still playing. You’ll recall Cannavaro won the Ballon d’Or that year. Nevertheless Toni still became the first player to score more than 30 goals in Serie A in 47 years. Totti’s was no less remarkable. After playing the first 15 years of his career as a No.10 or out on the left wing, he did it in a pioneering False 9 role. The perception of Serie A has always been that it is the hardest league for a striker. In the modern era - let’s say from the beginning of the Champions League - La Liga has had 10 players hit more than 30 goals. The Premier League has had eight. Toni is the only one in Italy. Even amid a general decline in standards, that impression persists not least because the emphasis on tactics is greater and the starting point when setting a team up is on stopping an opponent from playing. While that’s true, it must be said Serie A has also got more expansive in recent years. Teams go for it more. 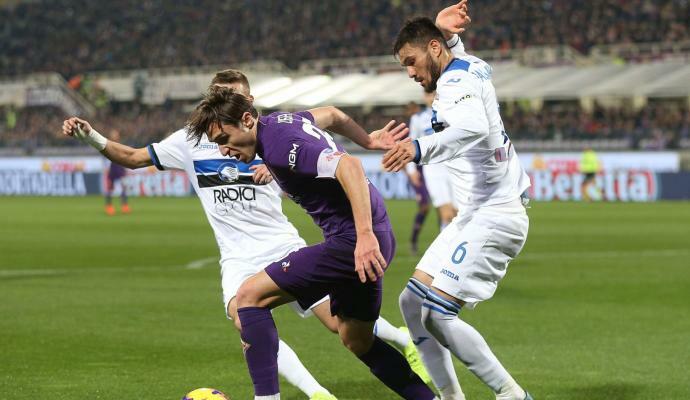 A change in culture is discernible, particularly in the style and manner of play expressed by Napoli, Fiorentina, Roma and Empoli. Last season there were more goals in Serie A than in any of Europe’s top five leagues. This season there wasn’t a 0-0 until the end of September. That hadn’t happened since 1949. Peculiarly enough when it did happen, it involved Napoli. From then on, however, things have gone back to normal. ‘Only’ 759 goals have been scored in Serie A this season. That’s 2.53 per game. A lower average than the other top five leagues with the exception of Ligue 1. Twenty two goals have been enough to crown the Capocannoniere in each of the last couple of seasons, which should only make the scale of what Higuain is achieving more impressive. For instance, If the season were to end now his total would still be enough to win or share the title in all but one year since 1959 and there are still eight games to go. Higuain has scored more goals than Udinese, Verona , Atalanta, Palermo and Carpi . Where is the competition? Take a look at the scoring charts and you’ll see it is miles behind. Carlos Bacca and Paulo Dybala are on 14 a piece, a difference of 11 goals. Not since the great Giuseppe Meazza in 1930 has anyone led the Capocannoniere charts by such a margin. Higuain’s total is more than double that of his nearest rivals which is kind of appropriate because doppietta has been his trademark this season. Sunday’s against Genoa was his eighth of the campaign. Big games haven’t missed his impact either, rubbishing the notion that he is a choker. He has found the net against Juventus, both Milan clubs, Fiorentina and Lazio. The penalties he once missed are going in too. He has now scored three in a row. Twelve of his 29 goals have come on the road. These are all moments when a team needs its best player to perform and Higuain has not disappointed. His dwindling number of detractors will bring up the top of the table clash in Turin in February but if it were not for Leonardo Bonucci’s big toe, arguably the best piece of defending in Serie A, he would have scored from point blank range. If Napoli are even in this title race - the Bernard Thévenet to Juventus’ Eddy Merckx to use Maurizio Sarri’s analogy - much of it is owed to getting the best out of the league’s best player. Napoli have been unorthodox about how they have gone about it. Sarri has called Higuain “lazy” and a “d**khead”. Aurelio De Laurentiis has accused him of being a kilo overweight. Reverse psychology or not it is having the desired effect. Napoli have never had as many points  at this stage of the season as they have now. Higuain’s goals account for 23 of them. “In any other league we would be top with a big lead,” Sarri said on Sunday. Much of the attention at the weekend understandably focused on Gigi Buffon breaking Sebastiano Rossi’s 22-year record for minutes without conceding. For a goalkeeper it is the maximum. For a striker, however, the record no one, aside from Toni and Antonio Angelillo has been able to get near is one established by Gunnar Nordahl in 1950 when the legendary Swede scored 35 league goals in a single season. To break it, Higuain needs seven from Napoli’s eight remaining games at home to Verona, Bologna, Atalanta and Frosinone and away to Udinese, Inter, Roma and Torino. He has scored against all of them in the past. Since moving to Italy two and half years ago, Higuain has found the net against 22 different teams and if he has the same success he had in encounters with these opponents in the first half of the season when he scored 10 times, he will make history. The season he is enjoying is one for the ages and is it really any wonder Napoli are seeking to extend his contract beyond 2018, bump up his wages and increase his buy-out clause from €94.7m to in excess of €100m. The last time a Napoli striker topped the scoring charts - Edinson Cavani on the total Higuain is on now - he left that summer. Napoli fans would only accept it, one imagines, if his parting gift was the Scudetto. That’s the priority. Nordahl’s record comes second. Deliver both and Iodice will have to get his paintbrush out again.